Considering the deformations appeared after the firing process of ceramic, we tried to establish if there is any relation between these and the type of peripheral preparation, on the one hand, and the coefficient of thermal expansion of metal and porcelain, on the other hand.The study is original and was conducted in COSMOS DesignSTAR, consisting in finite element analysis of firing process. The tested objects were created in RhinoCeros Nurbs modeling for Windows, version 4.0. It consists of three models, each one with abutment, metal cape and ceramic veneer, but with different type of peripheral preparation: shoulder with metal collar, shoulder without metal collar and chamfer with metal collar.The results suggested that the shoulder without metal-collar model recorded the highest marginal distortion and the chamfer model the smallest, and the higher the difference between thermal expansion coefficients the higher the marginal distortion . Anusavice KJ, Gary AE: Influence of framework design, contraction mismatch, and thermal history on porcelain checking in fixed partial dentures: Dent Mater 1989; 5: 58-63. Bertolotti RL, Moffa JP. Creep rate of porcelain-bonding alloys as a function of temperature. J Dent Res 1980;59:2062-5. Buchanan WT, Svare CW, Turner KA. The effect of repeated firings and strength on marginal distortion in two ceramometal systems. J Prosthet Dent 1981;45:502-6. Campbell SD, Pelletier LB. Thermal cycling distortion of metal ceramics :part l - metal collar width. J Prosthet Dent 1992;67:603-8. Campbell SD, Pelletier LB. Thermal cycling distortion of metal ceramics: part II - etiology. J Prosthet Dent 1992;68:284-9. Campbell SD, Sirakian A, Pelletier LB, Giordano RA. 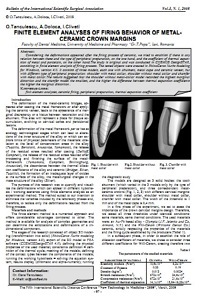 Effects of firing cycle and surface finishing on distortion of metal ceramic castings. Prosthet Dent 1995;74:476-81. Dederich DN, Svare CW, Peterson LC, Turner KA. The effect of repeated firings on the margins of nonprecious ceramo- metals. J Prosthet Dent, 1984:51:628-30. DeHoff PH, Anusavice KJ. Effect of metal design on marginal distortion of metal-ceramic crowns. J Dent Res 1984;63:1327- 31. Hojjatie B, Anusavice KJ. Effects of initial temperature and tempering medium on thermal tempering of dental porcelains. J Dent Res 1993;72: 566-571. Nakamura Y, Anusavice KJ. Marginal distortion of thermally incompatible metal ceramic crowns with overextended margins. Int J Prosthodont 1998;11:325-32. Shillingburg HT Jr, Hobo S, Fisher DW. Preparation design and margin distortion in porcelain-fused-to-metal restorations. J Prosthet Dent 1973;29:276-84. Silver M, Klein G, Howard MC. An evaluation and comparison of porcelains fused to cast metals. J Prosthet Dent 1960;10:1055-64. Tuccillo JJ, Nielsen JP. Shear stress measurements at a dental porcelaingold bond interface. J Dent Res 1972;51:626-33.